Our guiding teacher, Rev. Hye Wol Sunim, is an ordained monk with extensive practice in Zen and mindfulness meditation. Rev. Sunim is fluent in several languages and translates early Buddhist teachings from their original Pali into English. Having studied and taught on three continents, Rev. Sunim brings a depth of understanding and a capacity to explain esoteric and complex teachings that is quite unique outside Asia. His sense of humor and engagement in everyday life make him warm and accessible to novic es and advanced practitioners alike. We teach mindfulness meditation, what is often called insight or vipassana meditation. Our meditation classes provide the basic skills and experience required for the development of a lifelong mindfulness practice. Our approach to meditation is based on the Buddha’s discourse on the Four Foundations of Mindfulness (the Satipatthana Sutta) in which he explains the conditions under which mindfulness arises and the hindrances that get in the way. Our meditation classes are limited to 14 people so each student receives individual attention. We start by providing a detailed introduction to meditation and assist each student to find sitting postures appropriate for their body. 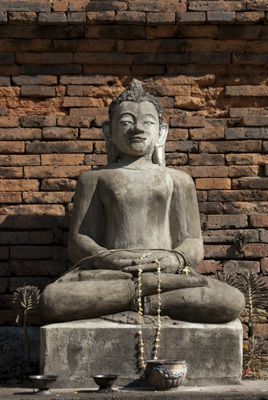 Our approach emphasizes the experiential process of meditating. We organize our classes around short periods of meditation and an exploration of the meditation experience. By exploring what students’ actually do while meditating, we help them identify their mental habit patterns. As their attention becomes more stable, they feel more concentrated, calm and peaceful. Cultivating a daily practice trains the mind to respond with less reactivity as it changes the physical structure of the brain to better process emotion and new information. We become less judgmental, more appreciative of others, more openhearted towards the world and happier in our lives. We offer a variety of meditation trainings for the general public and mental health professionals. Our half-day and daylong introductory meditation workshops offer the basics for starting a personal practice. For those with established practices, our topic-oriented meditation workshops explore advanced issues and their application to clinical practice. Our seven-week Introduction to Mindfulness courses are comprehensive introductions to mindfulness meditation designed to start your daily practice. We offer several activities related to meditation. Reverend Hye Wol Sunim leads a sutta study on Sunday mornings from 10:00 am to noon where we meditate for 30 minutes, listen to a dhamma talk for about an hour and then close with 20 minutes of meditation. For those interested in learning meditation, we teach half-day, daylong, and seven-week classes to introduce participants to mindfulness meditation and help them start their daily practice. We also offer individual sessions, but we find that a group context for learning meditation is more beneficial for new practitioners. Use this link to access our Sutta Study Resource page. Than two men engaged in combat.